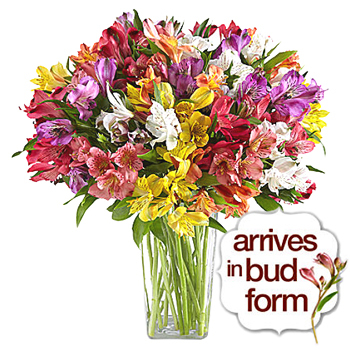 Alstroemeria, also known as Peruvian Lily or Lily of the Incas, is a fascinating, unusual and versatile plant - perfect gift bouquet for any versatile lady. It grows in the winter and in the summer, and so is as perfect for the winter holidays as it is for the summer ones. Whether it's your anniversary, or her birthday, whether you want to say sorry or just tell her how beautiful she is, this gift basket is a great way to do it all.